Jasmine Krush is a DFW native, born and raised in Southlake, Texas. After graduating from high school, she went on to attend Texas Tech University. There, she graduated with a Bachelor of Arts in Public Relations in 2013. She then went on to attend law school at Oklahoma City University School of Law in Oklahoma City, Oklahoma. During her time there she was a class representative for her class for two years, was a member of Phi Alpha Delta Law Fraternity and was involved in many other groups and activities. Jasmine was admitted to the State bar of Texas in 2017. Here, Jasmine is a member of the Tarrant County Bar Association. In her free time, Jasmine enjoys traveling, spending time with her family, friends, husband and adorable French bulldog. 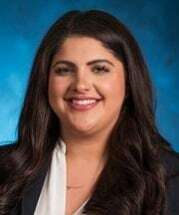 Jasmine joined the Bailey & Galyen personal injury team in 2018 to protect the rights of injured individuals to negotiate settlements related to motor vehicle accidents, premises liability, dog bites, and slip and falls. You can now have a Texas Personal Injury Attorney at your fingertips! The Bailey & Galyen Personal Injury Lawyer App gives you access to top rated attorneys throughout Texas including Dallas, Houston, Fort Worth, Arlington, Bedford, Grand Prairie, Mesquite, and Weatherford. Jul 09 - YOU STAND FOR US; WE STAND FOR YOU. Don’t wait to get help from an attorney. Contact us now for a free consultation. Choosing an attorney to handle the case can be one of the most important decisions that person will ever make... This entry was posted on Monday, April 8th, 2013 at 2:55 pm and is filed under Personal Injury. Call for an appointment at an office near you. Bailey & Galyen is one of the most recognized consumer law firms in Texas who has provided legal services for over 30 years. We offer an exceptional level of attention, respect and skill to each of our clients. Bailey & Galyen may be a large law firm, but we have a commitment to carefully tailored legal representation. *There is a $150 charge for Civil Law consultations. At the law office of Bailey & Galyen, we won’t charge you for an evaluation of your case, so you can find out what your rights are without it costing you an arm and a leg. To schedule a free initial consultation with an experienced lawyer, send us an e-mail or call our offices at one of the convenient locations listed below. Our phones are answered 24 hours a day, seven days a week. Bailey & Galyen, Attorneys at Law, represent clients in Arlington, Bedford, Dallas, Fort Worth, Grand Prairie, Houston, McAllen, Mesquite, and Weatherford, as well as Tarrant County, Collin County, Denton County, Ellis County, Harris County, Hidalgo County, Kaufman County, and Parker County in Texas.